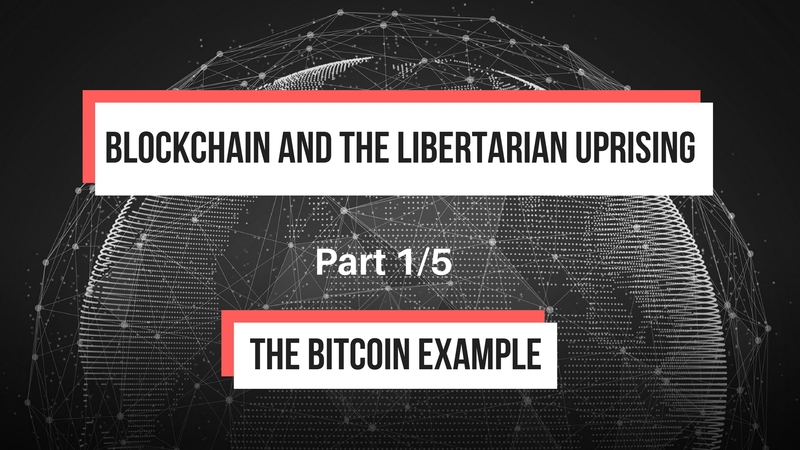 This is part 1 of a 5 part series adapted in blog format from my senior research paper titled “Blockchain and the Libertarian Uprising“. Why do we trust a currency backed by a government that is fourteen trillion dollars in debt? Ever since 1971, when Nixon announced that US dollars could no longer be redeemed for gold, the value of the dollar has been based on our faith in it; we trust that a dollar with be worth something tomorrow, so we accept dollars today (Source). Everyone who uses the dollar has put their trust in the central authority of the US Government (The Treasury, Federal Reserve, etc.). If you are a government, you create currency by manufacturing tokens of exchange and stimulate the flow by requiring that all taxes and fees be paid in your approved token. If you are Satoshi Nakamoto, you create currency by releasing ingenious code designed to run on an infinitely scalable network of globally distributed computers. Enter bitcoin; enter the blockchain. “Now we have a small piece of pure, incorruptible mathematics enshrined in computer code that will allow people to solve the thorniest problems without reference to ‘the authorities’” (Source). With blockchains, individuals no longer have to trust in an authority to keep secure records. Blockchains are to trust what the internet is for information (Source). If the internet has taught us anything it’s that when change comes, it comes fast. Suddenly, central government may seem as archaic as the feudal system. Perhaps, society no longer needs a government-backed currency to facilitate exchange. What if individuals had total control over their data online? Maybe a liquid democracy is not only possible but necessary in today’s blockchain economy. Libertarians have long advocated that the sole purpose of government is “to protect individual rights to life, liberty, and property, and not abrogate these rights” (Source). By this Libertarian view, the United States government is bloated with unnecessary duties that blockchain technology is poised to organically force into obsolescence. 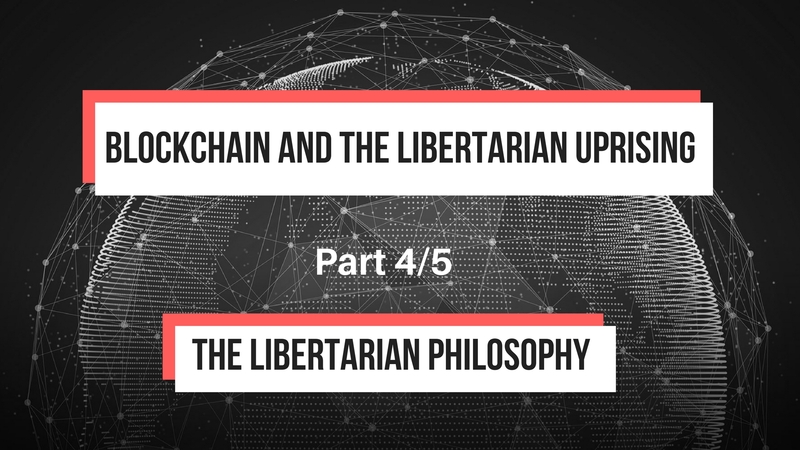 Should the blockchain fulfill its full potential, it will become the backbone of the Libertarian uprising. Bitcoin is the first and largest implementation of a digital globally distributed decentralized ledger or “blockchain”. “A blockchain is a shared, distributed database that acts as an immutable ledger, recording entries and verifying them across a number of independent participants. Once an entry is made, it’s marked with a unique hash code that places it sequentially in the ledger” (Source). In the last decade, bitcoin has demonstrated that a currency can exist without any government to endorse or perpetuate it. 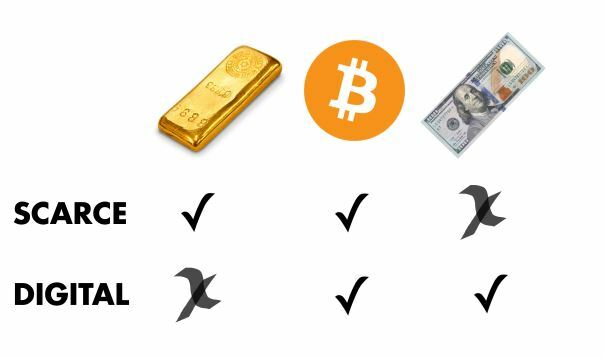 Bitcoin is like digital gold that can be traded from person to person without a bank to keep track of all the transactions and levy fees (Source). However, the gold analogy is misleading. An individual’s bitcoins are not stored in a computer file or as a record in a central database like a bank account balance. All of the bitcoins in “circulation” lie in bitcoin’s blockchain which is an active record of every bitcoin transaction since bitcoin came into existence in January 2009 (Source). Every transaction recorded in the bitcoin blockchain includes the sender, the receiver, and the amount of bitcoin sent in the transaction (Source). Therefore, any individual’s bitcoin balance can be determined by simply adding up the individual’s incoming bitcoin and subtracting the outgoing bitcoin for every transaction that individual has ever taken part of. The bitcoin blockchain is assembled by a globally distributed network of computers that verify each and every transaction (Source). Roughly every 10 minutes, like the heartbeat of the network, all the transactions that have occurred in that span are placed into a “block” and are cryptographically signed in such a way that it mathematically relates to the all the transactions in the block that came before it (Source). The computers that do this verifying and cryptographic hashing are called “miners”. Other computers, called “nodes”, store complete or partial copies of the entire blockchain and are updated as new blocks are appended (Source). The computers that comprise the network that builds and verifies the Bitcoin blockchain are owned and operated by individuals who are incentivized for their service to the bitcoin network by automated bitcoin payouts proportional to the amount of computing power they provide (Source). There is a fixed supply of 21 million bitcoins that can ever exist (Source). Currently, 12.5 bitcoins are created every time a new block is added to the blockchain (Source). These newly created bitcoins serve as the payout to miners mentioned earlier. Individuals who wish to use bitcoin need only a small piece of software called a “bitcoin wallet”. Each wallet issued has a unique address made of a string of random numbers and letters (Source). In order to send someone bitcoin, only their wallet address must be known; thus making bitcoin a pseudo-anonymous currency. 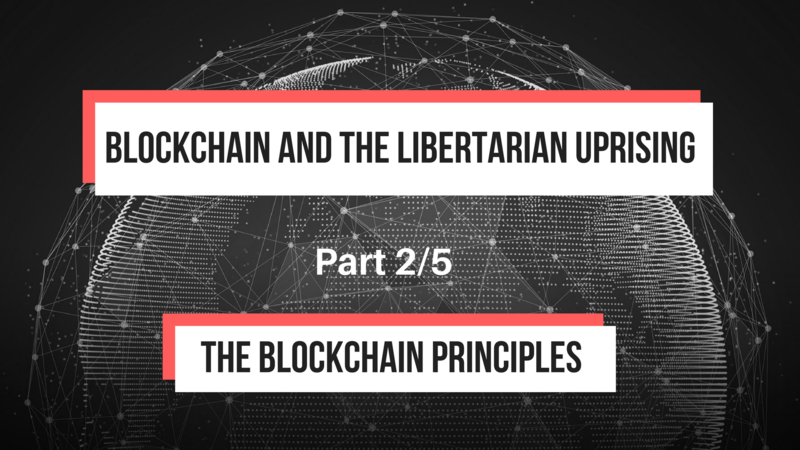 This is part 4 of a 5 part series adapted in blog format from my senior research paper titled “Blockchain and the Libertarian Uprising“. One of the first promising non-cryptocurrency applications of blockchain is the smart contract. A contract is generally a written agreement between two parties (e.x. A tenant agrees to pay $600 per month to lease a property for 12 months from the landlord.) Smart contracts are self-fulfilling contracts that are stored on a public blockchain (Source). Smart contracts allow “if this then that” statements and integration with the internet of things while removing the need for a centralized authority to manage the transfer of assets (Source). Smart contracts have applications in nearly any industry where asset exchange is core to operations (insurance, land title transfers, mortgages, securities, supply chain, and record keeping of any kind) (Source). Smart contracts could replace the need for heaps of paperwork, traditional centralized record keeping, banks and even attorneys. Your doctor holds your medical records, your school holds your transcript, your employer holds your work contract, your credit card company holds your purchase history and your bank holds your money. Pre-blockchain, this arrangement made sense. A trusted authority should hold the assets of individuals to ensure they are not tampered with or lost. However, since the advent of blockchains, technologists have discovered radical ways that the technology can be used to give individuals ownership of their personal assets and identities. Blockchain Helix is one such company working to create a digital identity for individuals whose goal is “enabling trusted and secure digital economies and societies” (Source). Blockchain Helix allows individuals to create profiles and build their online identities by adding personal information, certifications, diplomas, and official records (Source). All the information is recorded on a blockchain allowing the individual complete control over who has access to their personal information (Source). Blockchain Helix also partners with information providers to allow maximum interoperability and portability of the information (Source). “The Blockchain has brought us immutability. The combination of cryptography and distributed networks basically changes our understanding of digital security. And also it has created something completely new: An infrastructure that eliminates the need for trust” (Source). A driver’s license contains way more information than just the cardholder’s birthday, however, we will disclose all this unnecessary information whenever we need to prove our age. Personal online avatars like the ones provided by Blockchain Helix will solve this problem of data minimization; limiting the personal data revealed to only what is needed. Blockchain implementations like this stand to give individuals more ownership of their data. After digital avatars become the norm, there is nearly no limit to the kinds of information that can be stored in them. Blockchains will create secure, trusted digital identities for individuals in this new digital society. Recall that libertarians believe that all individuals have the right to life, liberty, and property. While “life” and “liberty” may be a bit too abstract for blockchain to secure, property rights are where blockchain technology excels. “Property transfers enabled by smart contracts can deter fraud and improve transaction integrity, efficiency and transparency” (Source). Smart contracts remove the need for settlement agencies, deeds, and mortgage arrangements (Source). Smart contracts for property transfers are especially promising for the billions of individuals around the world who have no proof of ownership of their land (Source). Smart contracts bypass potentially corrupt government record keepers and create a secure, permanent and public account of who has the rights to a property. Before blockchains, property rights had to be enforced by either the individual or a trusted central authority. Blockchains for asset management are eliminating the middlemen and allowing individuals greater protection of their property rights. The “Spontaneous Order” tenet of libertarianism as described by David Boaz is deeply philosophical and difficult to address with only a technology like blockchain. The growth and integration of the internet into our daily lives may provide an analogy for how we could expect to see blockchains in the coming decades. After all, we no longer “log on” to the internet, we live on the internet. Similarly, as more and more processes (from supply chain, to management, government, and healthcare) become automated using blockchain technologies, we may find that society is behaving like an autonomous organism rather than a nation-state with a clear hierarchical structure. The Economist calls blockchain “The Great Chain of Being Sure About Things” (Source). 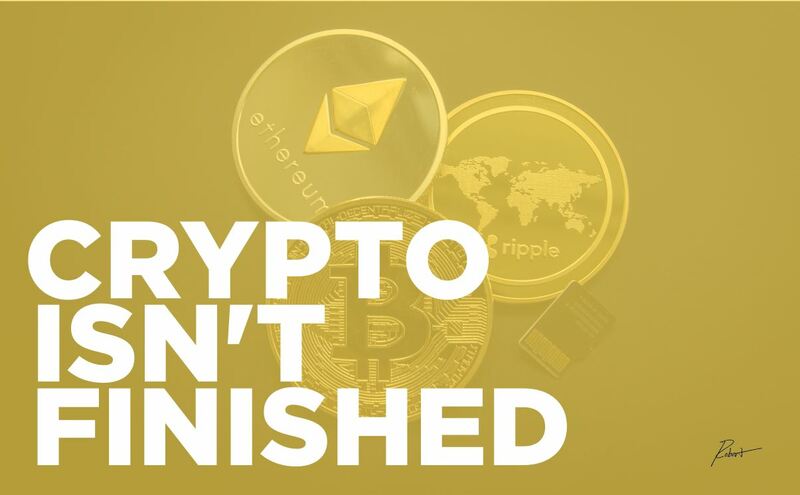 In the same way that two parties can transact in bitcoin without having to trust each other or some intermediary like PayPal, or Mastercard, blockchains are handling digitized assets without the necessary trust of an intermediary. Instead, the trust is in an network of self-organizing, self-serving actors (miners and nodes) operating by the incorruptible nature of mathematics. Well designed blockchains will create this spontaneous order out of thousands of individuals who are just going about their day to day, trading, speculating, and volunteering their computers in reward for digital tokens. In 2016, the tech non-profit Democracy Earth Foundation used blockchain to allow Colombian expatriates to express their opinion of the Colombian government’s decision to pass a peace treaty (Source). Blockchain made secure and fraud-proof electronic voting possible for expats who did not have access to traditional electoral mechanisms in Columbia. Democracy Earth Foundation wants to experiment with a sort of liquid democracy. For example, such an opinion poll could delve deep into the tenants of a specific treaty and find what clause, in particular, was a dealbreaker for citizens (Source). The Colombian Ministry of Information And Communications Technologies foresees that “governments may come to realize that the security and integrity of electoral processes is not just a matter for state control, but also an area that can be guaranteed collectively, supported by blockchain” (Source). Prediction markets operate on the observation that large groups of people can predict future events with a fair amount of accuracy. Augur is a decentralized prediction market using blockchain to foster collective intelligence by gamifying the prediction process (Source). Augur allows anyone to create a conjecture based on the outcome of a future event (Source). Example queries include “Will Hillary Clinton win the 2016 Presidential Election?” or “Will Apple stock price rise more than 3% this quarter?”. Participants place bets on the outcomes and are rewarded if they predicted correctly (Source). Using machine learning on this model, Augur hopes to be able to harness the wisdom of the crowd to accurately predict future events (Source). Pairing blockchain-backed voting mechanisms with decentralized predictive markets may allow individuals to provide useful input on critical policy decisions. In an age of instant global communication, representatives can routinely poll constituent views and even allow the platform for a liquid democracy. In an age of blockchain, we can rest assured that these votes are valid and that the voting system will not be compromised. Assuming high relative accuracy of prediction markets, policy makers will have a goto source for gauging how their policies will be received. The “Rule of Law” could develop out of a culmination of trustworthy polling mechanisms allowing politicians to better gauge public opinion and serve their constituents better. Of course, assuming that politicians are ultimately driven by their devotion to constituents is a very optimistic view of the contemporary political landscape. Corruption and “Big Money” churn out dishonest politicians every election cycle. However, some applications of blockchains may help with the monumental task of making politicians more honest. eBay currently manages the world’s largest reputation system (Source). Reputation systems are designed to create a metric of trustworthiness for individuals who transact or communicate with one another. eBay keeps a feedback score for all its members based on feedback generated by every other member that individual has transacted with (Source). However, eBay acts as the central authority, adjusting the feedback algorithm and holding each member’s score on its own databases (Source). Distributed reputation systems are similar to eBay’s except that they are stored on a public blockchain. There is no entity to adjust reputation weight, and more importantly, for politicians, there is no entity to blackmail or pay off. A distributed reputation system could permanently record a politician’s votes, bills, stances on issues, campaign promises, or leaked conversations in a trusted distributed ledger. “Elected representatives need to step up and show leadership in designing and implementing smart contracts. If you have integrity, why not encourage the creation of reputation systems?” (Source). Said differently, once a trusted distributed reputation system emerges, politicians who are not being monitored by such a system will immediately seem untrustworthy to the public. In a well managed and publicly transparent reputation system, inefficiencies would be apparent, corrupt politicians would be singled out and the result would be a drastically limited government becoming increasingly operated by smart contracts. One of the first use cases of bitcoin was as a payment method on The Silk Road. The Silk Road was the name of one of the first and largest dark web markets (Source). It was a hidden black market on the internet where users bought and sold illicit goods of every imaginable kind using bitcoin for it’s anonymous and [at the time] untraceable qualities (Source). While the currency used for exchange on The Silk Road was blockchain backed, the website itself was hosted on a traditional centralized server and the distribution chain relied on discrete packaging sent via the United States Postal Service and other private shipping authorities (Source). The Silk Road was shut down by the FBI in October 2013 but hundreds of similarly structured dark web markets have come and gone since then (Source). Today, the technology exists for a completely decentralized and unstoppable dark web market. Using Ethereum (decentralized blockchain cloud computing), BitChainDB (decentralized blockchain databases), and Interplanetary File System Protocol (decentralized blockchain file storage) dApps (distributed applications) can be created and released on to the thousands of globally distributed, individually owned and operated machines that make up this new-era blockchain-based computing network. A darknet market built on such a network would be nearly impossible to shut down. Pair such a site with anonymous cryptocurrency payments and a decentralized autonomous network of package delivery drones, as proposed by former Google employee Mike Hern, and you have the ingredients for an absolute free market operating outside of government regulation (Source). Anarcho-capitalists rejoice! Resonate is a music streaming co-op using a “Stream2Own” model (Source). Users of the service pay no flat monthly fee; rather micropayments are issued directly to the artist when a user listens to a particular song (Source). The first time a user listens to a song, she is charged $0.002 USD, the second time that song is played by the same user, a second payment is issued which is double the previous amount ($0.004) (Source). This pattern continues until a user has listened to a song for a total of nine times with total fees from the user amounting to $1.02 for that song (Source). After the 9th listen, the user “unlocks” the song and all future listens of the song are free (Source). The user can also choose to download any unlocked song (Source). Resonate uses the Ethereum network to issue instant micropayments to artists and bills the user for the amount spent each month in that user’s local currency (Source). Resonate’s founder, Peter Harris, claims that his unique pricing model allows artists to be paid twice what they would be paid on traditional streaming services while keeping the average user monthly fee below the $9.99 typically charged by traditional music streaming services (Source). By permanently and publicly recording creative rights and rewards, blockchain technology has the potential to allow creatives to receive fair compensation for their work. The model described by Resonate rewards artists who produce songs worth listening to again and again. The top internet companies today generate revenue from subscriptions (Netflix), intrusive advertisements (Facebook), commissions (Uber), and selling personal data (Google). The libertarian view of government intervention as the source of distress in a society can be seen equally with the internet corporations. The internet economy today is an extractive one; it takes in exchange for its services. To get around this, people pirate content, install ad blockers, and conduct business outside the platform to avoid fees. Additionally, media outlets generate clickbait articles or fake news to attract viewers and increase advertising revenue. The internet economy is lacking in natural harmony. A well-designed blockchain exhibits an extreme understanding of behavioral economics and aligns incentives. As we have seen with the bitcoin blockchain, all parties’ incentives are aligned perfectly so that any individual looking for personal gain is best off serving the network and making it stronger. A blockchain economy is a giving one; where users give their resources to the platform in exchange for services. Flixxo is a decentralized video distribution platform (like Netflix or YouTube). Users need to acquire Flixx Tokens, Flixxo’s proprietary cryptocurrency, to view videos on the platform (Source). While a user can purchase Flixx Token’s at any time there are alternative ways to generate tokens (Source). Flixxo does not use centralized servers like Netflix, it relies on the free storage space on it user’s computers (Source). Users can opt-in and volunteer their personal computer’s storage in return for regular token payouts (Source). Flixxo also allows users to opt-in and view ads that reward the user directly with immediate token payouts (Source). In this way, a user can pay for the service if he chooses, or he can contribute towards making the Flixxo network stronger. Since Flixxo does not have to pay for server space, their operating costs are significantly reduced allowing them to better compete by charging less for their services. Blockchains are poised to align incentives within societal and economic structures allowing for the libertarian ideal of “natural harmony” to emerge without an obvious middleman extracting profit from its users. Any technology or ideology claiming to usher world peace should be seriously questioned. From the libertarian approach, it is a noble effort. However, blockchains are not a cure-all solution for the world’s ailments.